The final book of a trilogy (always risky! ), Exile was a mixed read for me. On the one hand, it's consistent: it certainly doesn't dip in quality. On the other hand, the finale disappointed: especially in view of the build up! Essentially, Exile starts out as the story of Stormlord Jasper's tenuous rule, and of his partner Terelle's enforced journey to Khromatis, where she hopes to bring back more stormlords to aid the desertlike Quartern bring water from the sea. It's a well-conceived plot, and interesting: we get a lot more well-integrated history of Khromatis and the Alabasters, which were previously complete mysteries in the series. Unfortunately, Jasper's plotline isn't so interesting - Laisa and Senya are slightly predictable as antagonists, and while Jasper definitely develops, you'll soon be wishing for some of his more decisive moments in Stormlord Rising. While interesting and convincingly executed, it's also in Terelle's adventure that we get to see the problem of brevity. Essentially, while long, this book either needed to be two shorter but more-fleshed out novels, or to make cuts. The departure from Khromatis has been built up as almost impossible, but seems relatively simple when it occurs. Furthermore, a lot of discoveries simply aren't followed up from! We get tantalising clues about new relationships between nations, new discoveries about magic, etc... But it's impossible to see where they go. Luckily, the one plotline that doesn't fail in this regard is Kaneth's. 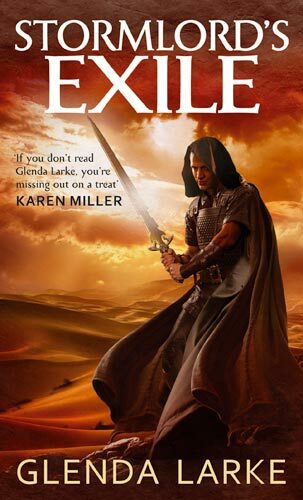 The Reduners were some of the more interesting characters in the previous books, and Exile puts them back where they belong: high-powered, intrigue-rich excitement. It's a fun and unpredictable conflict, and definitely brings the novel out of its slower moments, though it does lack for a more thorough explanation of Kaneth's new powers as 'Uthardim'. The ending to this series definitely isn't unsatisfactory, however - it's simply a lack of deeper exploration in terms of consequences that fans of worldbuilding may regret. Nevertheless, it's an engaging, fast-paced read with some rich history - and every one of the previous novels' characters get their turn to play a role in the climax. If you've been enjoying the Stormlord books so far, this is a must-read: just don't expect it to go much deeper. Thank you! :) Yes, the whole difficulty of leaving Khromatis is built up... And then they just do it. :P I would have liked a lot more exploration of rebuilding the Quartern and the new stormlords, but still, it was a fun read! I'll admit a preference for discoveries and explanations of the world's magic, and that Kaneth's new powers just seemed to go unremarked on was a little irritating to me. Still, nice read.